Dear Anna and Alessandra, Every year our family takes an annual summer vacation and my family agrees that this year's holiday was a real treat! To be able to stay in the country and enjoy this fabulous villa, but also to travel to Rome, Florence, the beach, beautiful gardens, amnd experience the small towns near the villa made this one of our more interesting, visually beautiful, and culturally appealing trips. Your tips on where to eat, how to get around on the train, where to park were most helpful and allowed us to see far more sights than if we had been working things out on our own. Thank you for your great hospitality! Mary F., Tom. W. , Rista, Alex, Andrew W.
Hello Anna + Alexandra - What a lovely contrast your beautiful home was after a week in florence - so welcoming with all the birds singing, the cats for company, flowers in bloom - second only to the week with special friends right here. Thank you for sharing your home. What a wonderful home! W./F. family had a lovely time here. We loved the pizza oven, Bocci court and the festivals (and beauty contests!) in ancient Orte! Instead of going all the way to Sienna + Florence we visited the hilltowns closer in (Spoleto, Spello, Montefalco) and enjoyed the excellent cheeses, olive oils and restaurants. Off to Rome on our last 3 days. Grazie! Thank you so much for our wonderful stay at Le Terrae! We had such a lovely time here. We enjoyed the beautiful landscape and the wonderful weather. Hopefully, we will return some day and enjoy this lovely house once again. Bianca S. and Brian W. - David + Jennifer S. - Matt and Nikki C.
Dear Alessandra and Anna, Le Terrae is a beautiful home and we thank you for allowing us to call it our own for our first week in Italy! When we get back to the US we will post pictures on your facebook page! Ciao. You are both very kind and you now have friends for life in Pa! Dear Anna and Alessandra: Thank you so much for the opportunity to stay in this special place. So much peace in such beautiful surroundings. This house is filled w/spirit and rich history. The perfect home base for exploring this lovely part of the country and for relaxing! We have adopted (and named) the five gattos who are living outside (momma, the kittens (1+2), crooked tail and our favorite, "Orangie"!) To those who come to stay, please feed these sweet loves...we've spoiled them this week...Enjoyed it! Elisa, come visit us in Los Angeles and bring (or send) mama Delores with you!! Dearest Alessandra, Elisa e Anna, I came to Italy for the first time as a Boy Scout in 1951. I returned on my first overseas assignment as a young officer (Army) 1958-1961 and nevere recovered. I returned many times, renewed Italian friendships and continue to study the language. If being Italian is a state of mind: Io Sono Italiano! The past three weeks away from cities, visiting the wonderful ancient hilltop cities, coffee with new friends in Vasanello, feeding the cats, enjoying the villa, the hospitality of Alessandra and good food from Dolores made it the best ever. All of this with my sister and brother in law and one week with a daughter and 9 year old granddaughter. Life is good. Thank you for a wonderful home to stay in during our visit with our parents/grandparents and family. Dolores is an amazing lady and we would love to take her home with us! I had a great stay! I loved being with my family! Wonderful visit to the villa sharing stories, good time and happy meals. Singing our songs through the hill towns of Tuscany and Umbria made our hearts light and our spirits soar. Thank you for sharing! Alessandra, Anna, Silvio and Dolores, What a beautiful home in an awesome Country. The people are warm, the countryside picturesque, the food delicious and your home has a soul unlike what we have ever experienced. Thank you Silvio for your gracious and patience driving us around. Thank you Dolores for your warm hearth and delicious food! Alessandra and Anna thank you for opening your home to our family. We will be beginning our married life (Jerry and Anna) together in your beautiful Country. What a great kick off! The house was great - lovely little towns surrounded us and provided much enjoyment. Thanksgiving here with our Italian family was an experience we will never forget! Absolutely beautiful - a perfect way to spend Thanksgiving. Thank you! Thank you for allowing us to share the warm russet red hospitality of this unique place. This temporary home has echoed with chatter and laughter from tower to kitchen. Now we reluctantly return to the real world recharged and refreshed. Nickie and Vince S. - Burt and Cindy E. - Ron, Denise, Briggs W.
Thank you for allowing us to spend our 50th anniversary in your beautiful home! Mary H., Ian L., Jeanne K., Mary R. and Dara S.
What a beautiful place. We are so glad we discovered Le Terrae. Thank you for sharing it with others. We just didn't have enough time. Dear Anna, Alessandra and Robert, Great cycling area! Loved Vasanello, friendly town. Pizza at Eureka superb, super friendly staff. Local wine and food all great! Would come back at a prompt. Roberto has great cycling routes, but there are many more! Grazie mille! Paul + Lynn P. E. Killingly, Connecticut, U.S.A.
What a wonderful house!!! With our parents and 3 children it was the perfect place to enjoy each other's company. Long, leisurely lunches under the amazing oak tree... all of us acting like children on the swing and everybody getting involved to coach Alexander (9) back down from the tree... We still haven't found out where the cat is keeping her litter of kittens, but hopefully we will see them next time we come back. 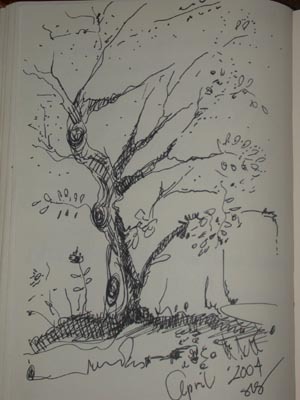 Our children (Alexander, Isabella (7) and Carina (4) have discovered their artistic talents by drawing various trees, plants and other, until now, undiscovered or known objects. The petanque area was used by all in animated games pitting generations against each other. The weather was just fabulous with tons of sun, and luckily the evenings cooled down enough for us to sit cosely by the fire with cups of hot chocolate. We had a wonderful time! Our stay in Le Terrae was our first time in Italy. I very much enjoyed it. It was fun to find your way around the house and garden as it is so big. The parc di Monstri (monster park) was great fun, especially the leaning house. The weather was sunny most of the time. I would love to come again and do the things that we didn't manage to do. I loved your villa! It was so beautiful + peaceful, I can't remember when I've been relaxed and slept as well as I did here! Thank you so much! I am not the fearless one of our group, but I feel that I gained courage from the beauty and warmth of your lovely home. I had the inspiration to start the book I had been trying to start. Thank you so much for the loan of your villa's inspiration. God Bless you and your loved ones. Thank you so much for the use of your beautiful home. It was perfectly located for what we wanted to see. We especially enjoyed all the beautiful flowers and bushes everywhere and the birds on the roof and the cats. The views are unbelievable! These 2 weeks have been magical have for us seven women from Ohio + GA (previous page). What joy this was staying at this charming and beautiful villa. God painted every morning and evening across the sky canvas. He dripped colors across the fields - green, yellow, red, purple. Flowers danced in the soft breezes. And the birds - what a symphony they presented each morning! This was just a touch of Heaven. The darling flowered pots and little cups, lace curtains, fresh flowers, photo albums and books! I spent time in the studio writing or in prayer. There were 7 of us, and we fixed huge salads, tore off chunks of bread and drank wine. Watered your flowers and fed the cats. One in particular came to the don each morning and waited for his meal. We have lived! The Mc A. Penny Jason David, Bellevue, WA. This was just a fantastic place. Alessandra & Anna: Thank you! We will be sure to try to come back. Merry Christmas & Happy '08! Grazie Anna & Alessandra A lovely taste of Summer and Fall weather with unfailing sun to store up against a New England winter. Enjoyed all your suggestions especially Sassolino's food and hospitality. Pizza oven here also a great success! Richard & Nancy A. Dan R. & Margaret B. Marcie B. & Alan S.
I love your house, I love the town and I love Italy. Mario, who speaks English, in the restaurant Sassolito, was helpful and friendly - plus the food was good. Thank you so much! It was a week in Paradise. The Villa was incredible, the village a delight. Among the villages I thought Bagnaia was a walk back in history. The Villa Farnese Palace and Garden a delight. A young Italian man with superb English helped the town guide, and made the highlight of the week for me. It was a perfect week. This has been a lovely visit to a part of Italy that I didn't know - and wow we feel right at home...what a nice town. The villa is a great spot for reunions with family and friends; everyone enjoyed it very much! Arrivederci! We have throughly enjoyed our stay at La Terrae! Italy is an incredibly beautiful country with so much to offer; our only regret is that we had so little time. We were able to visit Rome, Venice, Pisa, explore the countryside, hike and spend some quiet time here relaxing in front of the fire. We especially enjoyed our dinner tonight, our last night, at Sassolino. Mario treated us like family! The food was excellent, but more importantly, the warmth with which we were welcomed will leave us with the most wonderful memories of our time in Italy. many thanks for allowing us to stay in this beautiful home! We hope to return to Italy soon! Bellissimo Posto - mi ha piaciuto molto la bella fantasia del'architetti di questa casa...grazie infinite. Mille grazie - it was fantastic! Jaylyn O., Dale F., Matthew O., Deb & Jan W.
Dear Anna + Alessandra We loved! 7 of us had a wonderful time at your beautiful "villa". The house is charming, comfortable + we loved every minute here in beautiful Umbria. Special treat was Dolores, who cooked "deliciouso" + took great care of us. Hope to be back for more wonderful Umbrian days and nights. Dear Anna and Alessandra, We have now been here for almost 2 weeks and we have enjoyed our stay and Le Terrae to the fullest. We love the villa and the garden with all the beautiful roses, lilacs, irises, etc. not to forget the wonderful herbs to flavor our meals! (We finally found the COOP, after many wrong turns and asking for directions.) Dolores made us an unforgettable dinner and taught us the best way to roll out the pasta for tagliatelle! We also tried several of the recommended restaurants. The fish dinner we had at "Roberteschi" was fantastic! We have been to Roma, Assisi, Siena, Pisa....and touring around to lovely old hill top towns. And all the fields with red blooming poppies! Thank you both so much for all your help and preparations for our stay! Our group of six has had a wonderful experience, truly enjoyed the villa, thank you. We have been all over the beautiful countryside, drove through and ate in many walled cities. We started our trip in Rome and loved getting to the countryside. Beautiful, & enjoyed the beautiful exterior colors of the villa, lovely! Relaxed on the patio off the kitchen for sunsets in the evening with our wine. The flowers and herb garden were enjoyed by all. Jack especially was fascinated with the "mama kitty" and her four babies. We've had a marvelous time, thank you! What a delightful place to spend a vacation. This was our first trip to Italy & everything was so incredibly wonderful. How great it was to wake up to the fresh air & the birds singing. The walled cities were so fascinating & coming back to the villa to enjoy the flowers and views from here. Thank you for sharing your part of the world with us. Torill E. , Erik L. & Hilde L., Birte T. (Oslo Norway) & Arne T., Svein O., Randi L., Terje A.
Anna & Alessandra, We had a wonderful time in your beautiful spacious villa. The most memorable thing was my daughter & her boyfriend went to Florence for a few days & he proposed. They came back to the villa & my daughter had to flash the ring in my face, before I realized she had one. Of course, mother cried (tears of happiness.) We enjoyed the villa, the country, the people, the food and the lovely hill towns. I think I've lost 10 #'s walking them. Anna, Alessandra, Elisa: We are always available for computer deliveries to "Le Terrae." The house was wonderful and the week went by far too fast. Now that we have experienced the winter season, we want to try one of the other seasons. Elisa - good luck in school. Dear Anna & Alessandra, My family and I have so much enjoyed your home. We have spent a month here and have come to love Italy and this wonderful part of the world. We have seen the Etruscan ruins, the mostri park, Rome, Florence, Siena, Assisi, Pisa, Lucca, Viterbo, Orvieto and many, many other wonderful Lazio, Umbria and Tuscan sights. Now our dream is to come back and experience it all again in the warm, sunny summer months. Thanks to you both for making this such a wonderful stay for us. My family came from Florida to Russia, and we will never forget such a vacation. From the bottom of our heart, we thank you! Our stay in Le Terrae was our first time in Italy and first time out of the U.S.A. We truly enjoyed your lovely home and magnificent sunrises and sunsets. I never dared to dream I would see Assisi or St. Francis "Little Portion" The chapel he built stone by stone. The lower basilica St. Francis in Assisi, to walk where St. Francis and St. Clair lived - grew up. To visit the Vatican...Rome and the Coliseum. To spend our Thanksgiving here together with these wonderful children and grandchildren - How blessed we are! Thank you Anna and Alessandra for sharing Le Terrae Villa with us this week and helping make A Dream Come True. You are in my thoughts and prayers! Alessandra & Anna, We searched & searched for just the right villa; then we planned & planned; & then we arrived and realized all the searching & planning didn't prepare us for the beauty of your fantastic home & surrounding country-side. It's taken us a while to realize all the opportunities - we wished we visited the ceramic store early in our visit; done the Vasenello "stroll" earlier in the week; and read this book for other ideas. The restaurant recommendations were great; Dolores' visit & cooking school is a must; wine & cheese on the deck; and playing bocce. Thank you! This has been a week of dreams. I'm certain I've never encountered such beauty, character, serenity and excitement as I did this trip. The villa was a haven to come home to everyday. For anyone who stays - you must have Dolores come and cook for you. And a trip to Amelia rates as our favorite destination. The cats were entertaining and for the cat lovers with us, a touch of "home". I hope to be able to visit again someday. An unforgettable experience. Dear Alessandra - This was called a "ladies of the Villa" vacation for all of us - 9!! We traveled all over the area and visited many places: - Assisi - Spoleto - Orvieto - Monster Park - San Gimignano - Todi All were beautiful - But the Villa with the blue shutters was a refuge of peace - Thank you - Ciao! We really enjoyed our stay at this villa and meeting all the wonderful people in town. Alessandra & Anna were wonderful & we are already thinking about coming back. Thanks for everything. Please send our thanks to Dolores for preparing our food! Thanks for everything! The sun just set on our last evening in Le Terrae. A week of cloudless skies and delightful temperatures (although Roma did get a bit hot in the afternoon making our retreat to the villa even more delightful). The grapes are ready to burst. Our 18 and 21 year olds relished their first experience in Europe, soaking up the culture, taking a multitude of photos and storing up memories. They have already started to dream about their next (longer) trip. Dad enjoyed relaxing at the villa while the rest of us sojourned into Florence and Roma to see the magnificent sights, battle the metro & scatter like pigeons on the narrow alley like streets when the vespas and taxis rounded hidden corners. Each of the hilltowns we visited had its own special flavor (like the gelati). Thanks to Dolores, Alessandra and Anna for making our trip to Italy the highlight of our year. Having never been to Italy, I must say that I have fallen in love with this beautiful country and its people. Staying in this villa made me feel so "connected." It's such a good feeling to have this "home" to come back to after traveling for the day, be it to beautiful Florence, wonderful Siena, ancient Rome. Some of my favorite places were Lake Bolsena, Spoleto, Siena. But for an authentic experience, just go to the closest hill towns, both so beautiful and welcoming and charming. The locals treated us as if we were one of their own. Before I came here, one of my friends said that I would spend the rest of my life trying to get back here . They were right. Anna, you have a gem here in this villa. One of these days I will return to the place I have fallen in love with. Thank you so much for the use of your home and your hospitality. Our trip that day into Roma with you could not have been better. Viva Italia! Siena, Spoleto, Pisa, Florence, Venice and even Rome can not compare with the big hearts of Dolores and Silvio. They are the pot of gold at the end of the rainbow...So today we leave. But we will not forget our stay. We will not need the five hundred photographs we have taken to remember... because it's all in our memory like chiseled marble. So - do we say good-bye? No - we say "See ya later"
The "Hill towns" came alive for us during our wonderful stay at the villa. We spent wonderful days with Joanne + Bob Z. (our friends from Colorado.) The food was delicious - made by Dolores - enjoyed the pasta preparation. The town was a friendly place. We truly hope to return one day! Dear Alexandra and Anna - We have had a most wonderful and memorable week in your lovely Le Terrae Villa - We are Floyd and Eva Mae N., who live next door to Bob and Joanne Z. in Littleton, Colorado in the U.S. (Bob and Joanne's daughter is Jackie M. who told us of this place that people only dream about.) We have loved the hills, the sounds, the smells, the hill-top towns and the many, many friendly people, and the beautiful sunsets. We surely do hope to return for another stay when our souls need calming. Thank you! Thank you Alessandra for making sure we were set up for the week - the much needed trip to the grocery store! We really appreciated your time and thoughtfulness. Dolores Dolores, you are good! We so admired your talent. Our best meals in Italy were here at "home". It was a slice of heaven Thank you. Carrie O. Seattle (Vashon Island) WA. Dear Anna + Alessandra - Thank you for making your home so beautiful, comfortable and spacious! The four of us had all the space we wanted and didn't mind at all the rainy weather. 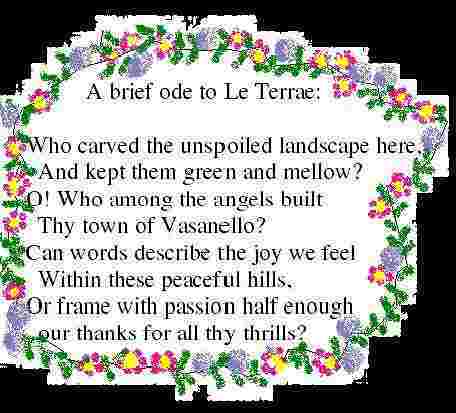 We loved the terraces, the trees, flowers and herbs in your garden. Our visits to many of the hill towns in the area were truly enlightening and we are filled with wonder at the incredibly intricate streets, passageways and houses built as they are in the sides of hills! We especially enjoyed Assisi, despite the lost cameras and Bassano in Teverina, as well as the wonderful Orvieto and Vignanello - The Terme di Orte + Lago di Bolsena and the Mediterranean were places of cooling relief! Mi piace Italia!! Grazie - mille grazie! Dear Anna, Alessandra & Robert, What a treat to have had Le Terrae all to ourselves for a week! Every morning we were greeted by a chorus of birds and of course - the sun! We ate breakfast each day in the terrace off the living room and marvelled at the view while we planned our next adventure. Thanks to yours many suggestions and those in this book, we feel we saw a lot of the area and its attractions. We would usually be gone all day - come back for an hour or so and then go out for dinner. It was so relaxing to have a "home" to come back to everytime. Your special touches of wine (Montefalco Rosso is our favorite!) and lush towels were greatly appreciated. Thank you so much for everything! Our group of 6 enjoyed our stay at Le Terrae very much. We ate and drunk ourselves silly, but didn't die. However, it was a close thing on the Italian roadways....We enjoyed having Dolores come in and cook for us! If anyone else thinks about having her come in do it early in your stay...there is so much food! We would like to thank Alessandra for introducing us to some local wines: we enjoyed trying them... Thanks so much! Carissime Anna ed Alessandra, oggi abbiamo incontrato il vostro sito con le foto della meravigliosa Villa Le Terrae! E' stato bellissimo rivederla e ricordare le stupende giornate trascorse da voi in campagna. Ho rivisto l'enorme quercia sotto cui adoravo mettermi a leggere al fresco, la sera! Abbiamo letto le parole entusiastiche degli altri vostri ospiti: solo chi è stato da voi sa quanto siano vere! Vogliamo anche noi lasciare un messaggio per consigliare un soggiorno a Le Terrae ai turisti che visitano l'Italia. Ma che cosa dire di più? La Villa è meravigliosa, accogliente, raffinatissima, degna dei più esigenti amanti del particolare e del bello. I dintorni sono tranquilli e davvero ricchissimi delle bellezze d'Italia: la posizione è veramente strategica per chi vuole visitare il Lazio, l'Umbria e anche il sud della Toscana! Appena potremo torneremo a trovarvi! Un abbraccio!! What a wonderful stay we had in your villa. Each day was more dear to us than the next. Colors seemed to bloom before our eyes each new morning in the yard. By mid week we could no longer drag ourselves away from our home and explore, we gave into the serenity. Many games of bocci ball were played. Competition between kids and parents becoming quite stiff. Most evening meals were enjoyed at carpe diem where we became regulars as evidenced by having "our table". Evenings were filled with roaring fires, card games and recaps of the day. We all faught off sleep us long as we could because we did not want to see another precious day go by. Thank you for giving us this opportunity to see a part of Italy which we might have otherwise overlooked. Arrivederci! To Alessandra and Anna, Thank you for the beautiful experience to stay in Le Terrae. We would love to stay longer than one week, but time to leave now. Surely we will come back to this lovely region. Thank You! To Alessandra and Anna, Thank you for making it so easy for all of us (party of eight from three different states!) to come together. Anna - The constant e-mails with information on sites and Villa layout; Alessandra - meeting my mother-in-law at almost midnight when the rest of us were fourteen hours late (with wine and pizza!). The stay at the wonderful villa was made even better knowing there was someone we could call with questions on anything. The experience here was as beautiful as we imagined. To future guests, Assisi is beautiful - many shops; people watching; Parco dei Mostri in Bomarzo is close and there is nothing like it in the States; Marmore falls in Terni is awesome!!! Rome, Florence, Venice - all possible from home base Le Terrae. ENJOY! What a beautiful setting for your villa – nestled among the vineyards and orchards. We love your home. Thank you for sharing it with us and thank you for all your wonderful suggestions for restaurants and sights. Good food, good wine, good friends – Dolce vita! We appreciate the tips for places to see in the area and the good restaurants. Beautiful setting. Dear Anna and Alessandra, We thank you for the use of your marvelous villa! We all had the most wonderful week. Your helpful tips on where to eat and what to see made the week for us. We all love the villa and hope to return. Thank you. Harry + Pauline C. Seattle, Wa. We love your villa and surrounding towns and were fortunate enough to be here for the Patron's feast day celebration on Friday with the procession through the streets and town let up with colorful lights and gathering of all age groups. It was fun to have seen the festive transformation of the town. Many happy memories. Thank you Thank you. Thank you so much for our most memorial vacation. To celebrate my retirement Frank and I fulfilled a long-time dream (a long-term vacation with the entire family in Italy. Our three children, three grandchildren and spousesall joined us for part of the time. 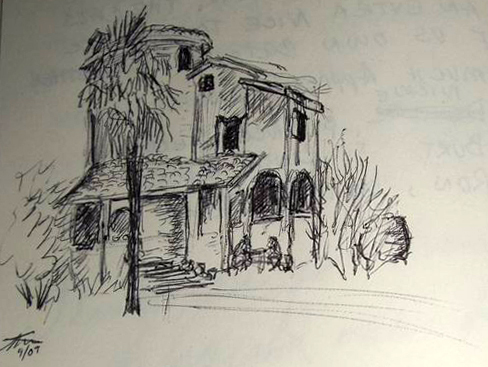 Your villa was wonderful (perfect) and Lazio was very special. Until we return again! Thank you so much for the stay in your beautiful house. It has been a lovely experience here in Italy.! Had a wonderful Christmas here at Le Terrae. Friendly people, great food, and the most beautiful scenery. Very accessable to all places and the shopping in Siena is fabulous. Thanks again for this beautiful home we all enjoyed! Dear Anna + Alessandra, Thank you for allowing us to spend such a lovely week in your home. it was far too short a time to do justice to the endless beauty of this part of Italy. We would just like to add a couple of comments for future readers and visitors: the stone sculptures at Bomarzo were well worth visiting and definitely take the advice of trying Zio Emilio's in town - the food is tremendous, and the proprietors generous and friendly. Thanks again." We have all greatly enjoyed this wonderful part of Italy, and the house is amazing - big enough for all eight of us yet very "homey"! The food, wine and people will all be remembered fondly - with many of us hoping to renew our acquaintance with Lazio in the future. Thank you for making us feel so welcome, it's been truly amazing! Dear Anna and Alessandra, We so enjoyed staying in your lovely home, especially all the wonderful meals we enjoyed on the terrace and the glorious views from every window. Thank you for all the thoughtful extras: the maps of local attractions, restaurant recommendations and the chilled wine. You really make us feel welcome.Sincerely. Dear Anna and Alessandra, Thank you for a wonderful stay at Le Terrae. We had a fantastic time. The nearby hilltowns were great to visit at night. In our stay we went to Rome, Florence, Pisa and a small town called Assisi. We all recommend Assisi for a relaxing, shopping day. We appreciate this once in a lifetime experience and we will never forget it. Arrivederci! We're leaving but I know we'll be back! We haven't experienced enough of this wonderful country, town, and villa. Thank you for contributing to a wonderful family vacation. Great place you've got here. Thanks. Thank you so much for allowing us to live in this exquisite place. La luce, i colori, l'accoglienza....un mix di piacevoli momenti in questa casa da sogno dove il tempo sembra si sia fermato....grazie per l'opportunita' accordataci di passare cinque giorni fantastici. Con affetto e sincera simpatia. What a whimsical, lovely house for our family to spend Christmas and New Year in together. We enjoyed country breakfasts, the fire glowing at night and the beautiful music that filled the house. Coming from Arizona, it took us a little to while to warm up here, but soon our "children" (a new pilot, an architecture student in Florence and a new University of Arizona student) were swinging on the swing, raking piles of leaves to jump in and playing marathon games of monopoly. If you are reading this, we recommend the towns of Todi, Spoleto and Assisi: this has been a wonderful area to explore! What a wonderful villa to show our children that Italy is more than a crowded Rome and busy Autostradas. A peaceful respite with beautiful vistas and interesting hill towns. Thank you again for these memories. This was our "Enchanted April". We loved our stay in Lazio... exploring the beautiful countryside...touring green hills and charming hill towns. Le Terrae was a wonderful base for exploring the countryside, its histories and cultures. A mother and four daughters could not have asked for a more special time together. Thank you for sharing your beautiful home. We love Italia. Thank you for making Le Terrae such a delightful place to spend the first week of our honeymoon. Such an exciting villa with proud views of the surrounding countryside made it difficult to drag ourselves away to see some of the nearby sights. We will remember our short stay here with great affection. Grazie per tutti: il bel posto, la casa, il sole meraviglioso e il buon tempo con amici! Fantastico! A Sunny Italian Festa, here at Le Terrae. Good food, wine, great company, fabulous place. The thermal baths in Orte were a big hit, as was Lago di Vico. Lots of sun, followed by Great thunder and lightingstorms. A splendid time was guaranteed for all. Very much enjoyed my stay away from the hassle of everyday life back home let alone having some sunshine for more than one day at a time. Should have sampled Italy sooner. Once again your beautiful country has woven its magic spell on us. Your lovely villa with its terraces and sunsets, the people as charming as ever and the chance to get to know this fascinating and unspoilt part of Italy which has so much to offer. Without doubt we shall be back. This holiday has been unforgettable, relaxing and invigorating;our accommodation superb and surrounding facilities (especially the restaurants!) excellent. Thank you for your advice. We look forward to the next time. Auguroni ed arrivederci. Charlotte & John D. - Bedford U.K.
We have had an amazing holiday. I am determined to return but only if I have learned to speak Italian sufficiently well to be able to converse with the wonderful people who are fortunate enough to live in this wonderful country. Beautiful scenery, beautiful food and wine and excellent company. La dolce vita! Lunches under the oak tree, showers with a view, the sun coming in the bedroom window, the friendly faces in town , and the view of Orte in the evening sun. Farther a field, Etruscan ruins at Sovana, the striped duomo of Siena , the lower basilica of St Francis in Assisi , St Peters in Rome . What a fabulous two weeks! This has been aperfect home base for travel and a wonderful refuge for relaxing. We were honored to be the first guests in your lovely home. It is aptly named. We moved from terrace to terrace following the sun. The many personal touches you left - the chilled wine, the melon & prosciutto, the directions to points of interest - all made it feel as if you were here as our hostess & not just the landlord. Your recommendations & maps made our visit much richer than any commercial guide book could have done, we'd add to the list Porto Ercole on the sea. It's only 1 1/2 hours. Thank you again & good luck on your new venture.